I had the chance to play this game when it was in beta a little while back, and now that it’s come time to set pen to paper for the finished product, I consider my past experience with it both a blessing and a curse. I say a blessing, because the game’s attempt at creating a JRPG pastiche was a little easier on the eyes the second time around. The bit about it being a curse, however, is because pretty much nothing has happened between the beta and the full release to fix the game’s overriding identity crisis. Ergo, like the reliable stodginess of a meat pie from the neighbourhood dairy, it’s best consumed sparingly and with less than lofty expectations. 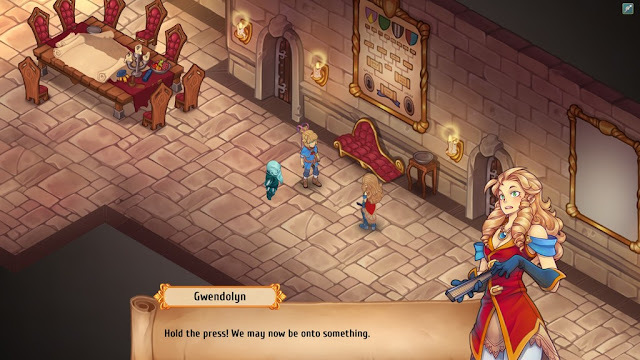 Pixelated Milk’s new title, Regalia - Of Men and Monarchs, is best described as being JRPG-lite. You play as a young monarch who’s recently inherited a kingdom from a dead relative, only to show up and find that you’re up to your eyeballs in debt. To add insult to injury, you’re told that you have to get an unreasonable amount of protection money together or risk losing the only thing that you’ve got left to your name. Armed with trusty sidekicks and naivety/ determination, you have to win over the affections of those under your rule and make sure that your castle doesn’t get repossessed. It’d be hard to find a safer narrative in the existence of storytelling. Now, I’m not expecting the term JRPG-lite to catch on, nor do I mean that it is “like” a JRPG, because its various components conspire to make sure that it plays like a different beast. Much like some varieties of light beer, it waters down the parts of beer that make it great, and turns it into a product that has a similar flavour but is an entirely different taste experience. In that way, it stays true to its advertising – an homage to classic RPGs – but I would argue that a good game has to be more than a vehicle for appreciation. Everyone and their mother’s dog has likely played Disgaea, and if they haven’t, then they’ve probably played Persona. 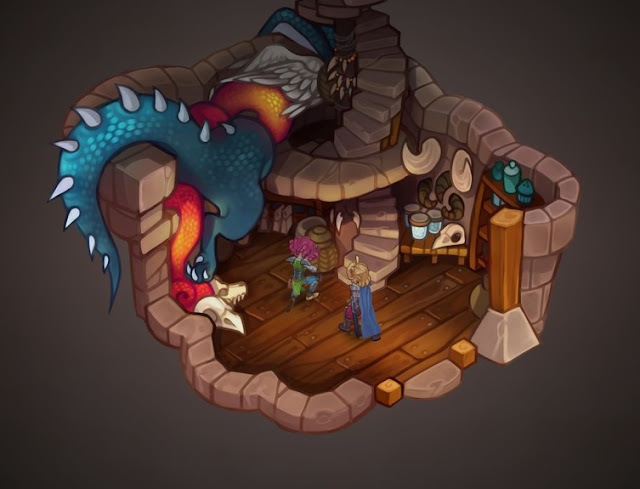 The team at Pixelated Milk has clearly drawn inspiration from those two titles and more in designing the Regalia’s core gameplay mechanics, especially considering the functioning of social bonds. After a good forty hours, the jury is still out on whether or not that’s worked for the studio. The game revolves around making it work with a motley cast of mates, most of whom are the usual offenders when it comes to RPG parties; the mysterious animal-girl (in this case, a woman literally raised by a beast tribe), the cunning merchant, and the bromance candidate. While the party you start with often seems a little too on the nose in terms of characterisation, I have to admit that they grew on me. Yes, they were fundamentally conceived from common RPG stereotypes. Yes, their motivations weren’t particularly complicated, and maxing out an affection bar was about as difficult as swiping right. Despite all that, I’m probably going to look back on them with fondness and remember the exact moment that we solidified our friendships. The kaomoji that popped up above your mates’ heads to show you how they feel never felt overdone either, even though they often seem like a distant relic of messageboards past. The bits and bobs that came with managing character relationships and quests in general were an incredibly shiny and incessant nuisance at first (and I still maintain that having a timetable of all your mates’ exact locations at any given time of the day is an uncomfortably small step away from following them creepily into a toilet), but they didn’t detract too much from your ability to enjoy spending time with people, and they were handy in their own way when your stable of acquaintances expanded to bloating point. Even checking off minor objectives in a questline turned into a satisfying activity; the detailed UI and its checklist format made it easy to feel like you were doing something of worth even during the smaller sub-quests. Sure, everything was a little cheesy, but I don’t deny that I had fun. What became less endearing over time, however, was the combat. It was my favourite part of the game during my virgin playthrough, but I quickly grew tired of the repetitiveness once I realised that what I loved about combat was the opportunities for character interactions. Fighting was actually the last thing on my mind. Normally, I’m happy to accept a certain degree of repetitiveness in RPGs, especially when it comes to grid-based combat. No one’s perfect, and I wasn’t expecting it to be a perfect blend of tactics and momentum. However, it soon became clear that there wasn’t so much a combat meta as what felt like a concerted effort to make sure that you could beat the game without needing to rotate more than one party member out every year or so. 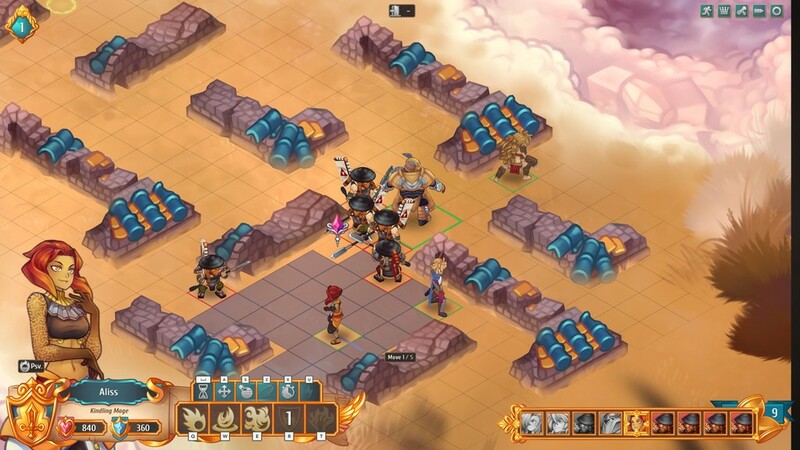 The combat interface is reminiscent of the Banner Saga’s approach – literal banners pop up near your characters and display their stats, and the system is based on using action points intelligently. You’re given skills that tie thematically into the core identity of the players, which is a neat bonus, and there’s a refreshing presence of emoting in the form of battle dialogue. Party members buffing others yell some sort of variation of, “you can do it,” every now and again, characters make a disgruntled noise when they miss, and if things are looking a bit bleak, they’re not afraid to call for help. Battles provide a stage for you to witness your party members struggle together, fight together, and enjoy victory together. In that sense, it was an atmospheric success. Thematically-coherent character skillsets aside, my gripe earlier about being able to mow down unfortunate hordes of club-wielding bandits with the same four teammates still stands. Got a tank? A support? Two DPS? You’ll have a great ol’ time in a Final Fantasy XIV duty, and you’ll be pleasantly surprised to find that the same tactics work here in Regalia. In fact, as long as you have those archetypes covered (which you will after the first short story arc), you’ll never have any real reason to swap out your characters ever again. Sure, you might want to do it to see what sort of dialogue they provide in the heat of battle, but in terms of whether or not that’s enough to actually compel players to want to use someone different? It’s just not enough, whether we’re talking in terms of depth, or in terms of difficulty. Most battles come with associated mini challenges like “Be the first to deal damage,” but that isn’t enough to alleviate the general sense of tedium once you’ve cracked onto the second half of the plot and somehow expended less effort on tactics than what it’d normally take to brush your teeth every morning. Regalia is a game that’s honest, and it’s a game with gumption. You can tell that there’s been a lot of effort taken in terms of content; they’ve made sure that there’s a wealth of in-game management to keep even the most anally retentive player occupied. The voice-acting, while it suffers from the same cheesiness as the social bonds, is enthusiastic and pleasing. However, Pixelated Milk may have done better if it had taken the best part of it all – the roleplaying – and said “screw it” to the other subsidiary stuff that seemed more like ill-fitting clothes the longer the game went on. I would have been totally fine with just exploring different worlds and maps with my friends without having to behead a flock of wild birds at every turn, and I would definitely have enjoyed that more even though grid-based combat is usually what gets me into games. The strongest part of Regalia was its multitude of lovable characters, and any interaction with them was where the game really shone; there just weren’t enough of those opportunities to carry the more cumbersome elements. Those new to JRPGs likely won’t have the same jaded lens to view this game through, but I maintain that for Regalia to have really made an impact, it would have had to aspire to more than being a tribute to those who have gone before.